Passport Photo Place provides express Mexican passport photo service. We take photographs and print pictures by the exact specifications as provided by the Embassy of Mexico. Mexican passport photographs must be submitted as printed versions. Electronic files are not accepted. Note that Mexican passport size photographs are also required for a 2-step process for Mexican visa applications. Mexican Embassy requires applicants to utilize professional photo studio services to avoid passport application processing delays and Mexico passport photo document rejections. Passport Photo Place provides express service and produces pictures that are 100% in compliance with the Mexican Embassy requirements. This helps to facilitate approval of passport applications on a timely basis and as scheduled. Guaranteed Mexican passport photo service. No Rejects! All Mexican passport photographs are taken and printed following the updated specifications as provided by the Mexican Embassy and Consulate General in Miami, FL. All photographs are taken and printed in our studio by a professional photographer that specializes in legal passport and visa photography for all immigration and travel documents. Passport Photo Place makes pro and great looking pictures that naturally represent the applicants. We utilize the most progressive photo acquisition and printing technology to consistently produce photographs that are accepted worldwide by Embassies and Consulates of Mexico. All Mexican passport photographs are taken and printed locally at our studio in Orlando, FL and are instantly available for pick up. 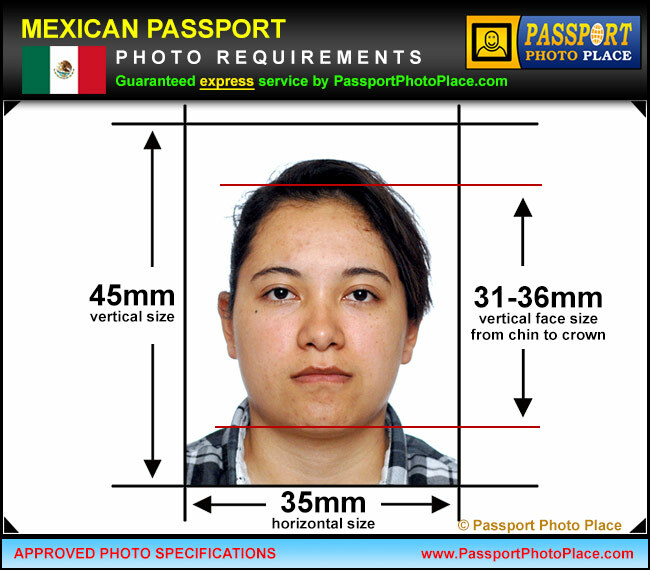 Mexican passport photographs must be printed at 300dpi or higher resolution using a professional photo printer. Inkjet printers are not acceptable for producing a passport photograph. Please wear a solid-colored top/shirt. White or slightly off-white tops are not recommended since the background for Mexican passport photographs is white and there must be a defined contrast between clothing, subject and the background.